with Rev. Myo-O Habermas-Scher, a voice teacher for decades – more info here. If you would like to come, please register now – or ask questions now. with Martin Bulgerin. After attending a class with him I knew I wanted him to share his work as part of the spring intensive.He may teach flower essences, or something else. His website is here. If this sounds intriguing, you’re encouraged to contact us now. Details later. You’re invited to join us for single events or a day, or ask about residential options for a weekend, a week, or longer. For residents, most days include morning and evening meditation, work, meals, and sharing of living tasks. There is space for a farm apprentice for this season. On work days, meals are offered. For non-work events, we ask a donation. 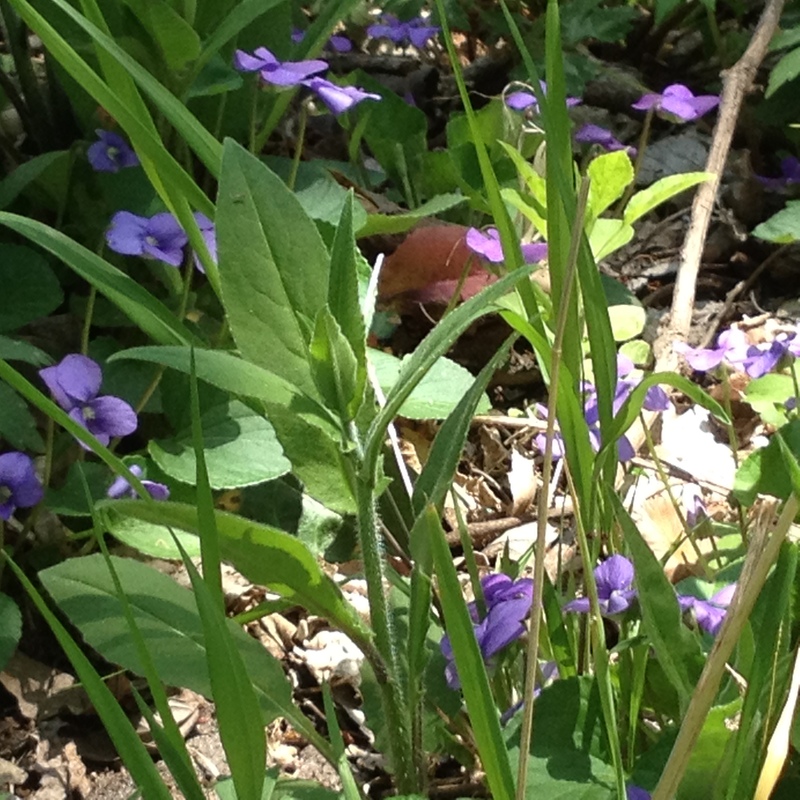 opening the intensive with sitting and walking meditation, walking outdoors, council time, and private time. with sitting and walking meditation, shared meals, gentleness. Concluding our 40 days of living close to the earth, we will create a closing retreat that includes meditation (zazen), land care, celebration, and simple ceremony. Spring weather is coming and going. Volunteers keep turning up, not in crowds but delightful small groups. Last Friday three college students came. 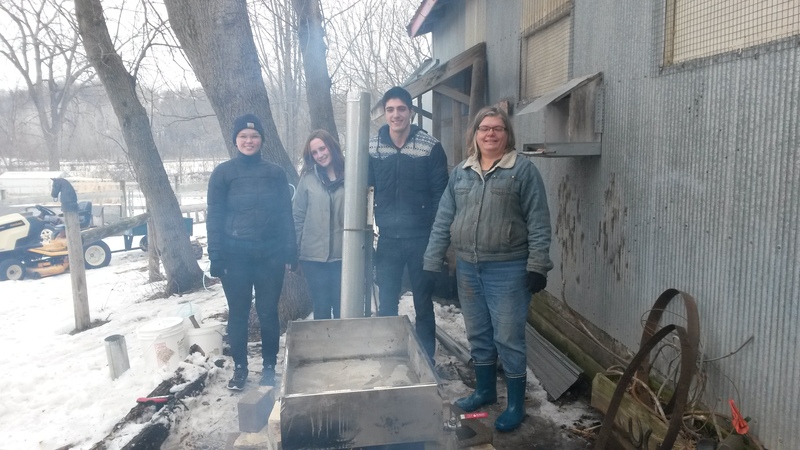 We cooked sap from box elders, gathered sap from all the trees, and took out the taps to end the season. Today and tomorrow I’m still cooking sap. 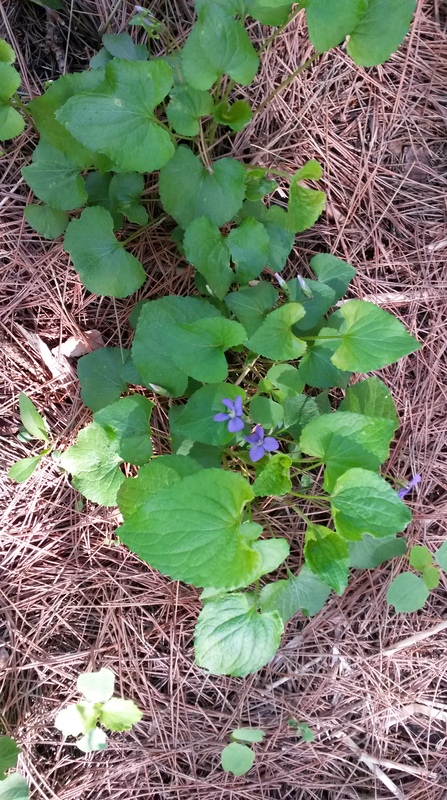 It’s an extravagant use of time, when I could be starting seeds indoors or prepping garden beds, but something in me needs to forage. And – yes! – we are now eating nettle soup and nettle pesto. I’ve been clearing the nettle spaces so I’ll be able to harvest more. If interested in buying nettles (with recipes) or nettle products, let me know.I can’t tell you how much energy they give! 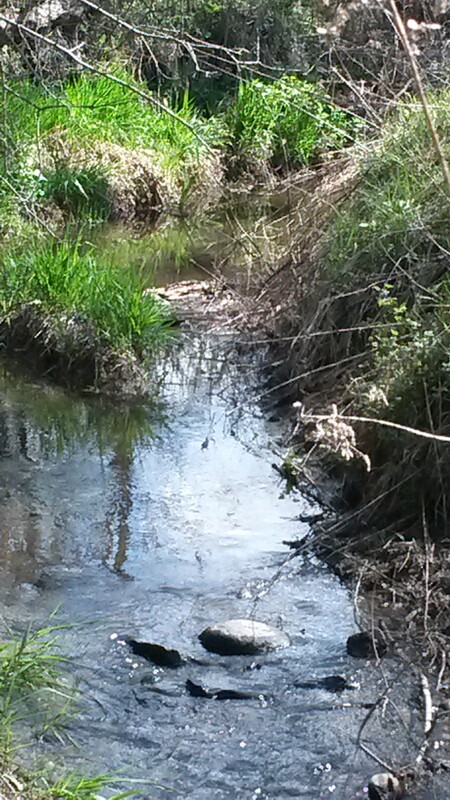 Yesterday Martin and three friends came to walk the land and get acquainted with the energies. I learned, interestingly, that they think more like engineers than mystics. That way of thinking is in my background but it’s been a very long time. Meanwhile, I’m committing myself to be a student of those energies, to let them teach me how to restore the land. 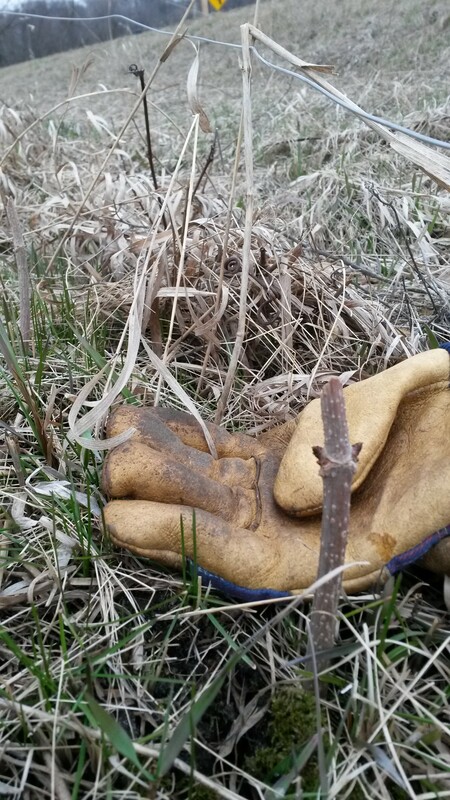 It begins where we pulled up buckthorn, and what to plant there. Of course that oversimplifies the task. I’ve studied what I can, and look forward to getting directly involved – and learning to listen. I was sick for two weeks – never sick enough to stay in bed (just one day) but mostly sick enough to be doing just the minimum. It’s good to finally be back to full functioning. 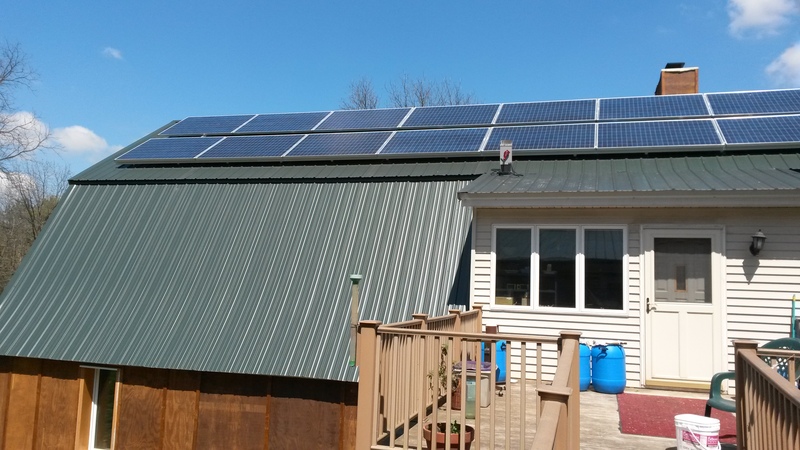 And the photovoltaic panels are halfway installed on the roof of the house. Pictures later. The pace is slow, now. If I were certain what to do, it might be faster. Abandoning ideas of being master of the earth requires listening, which requires slowing down. I think that illness probably was about slowing down, something hard for me to do. I continue to be amazed at being able to live in this beautiful space, after a lifetime in cities. I am trusting the land to call in the people who belong here, in all the many ways of belonging. (And I’m as involved in the current political scene as anyone, but don’t want to bring that here. 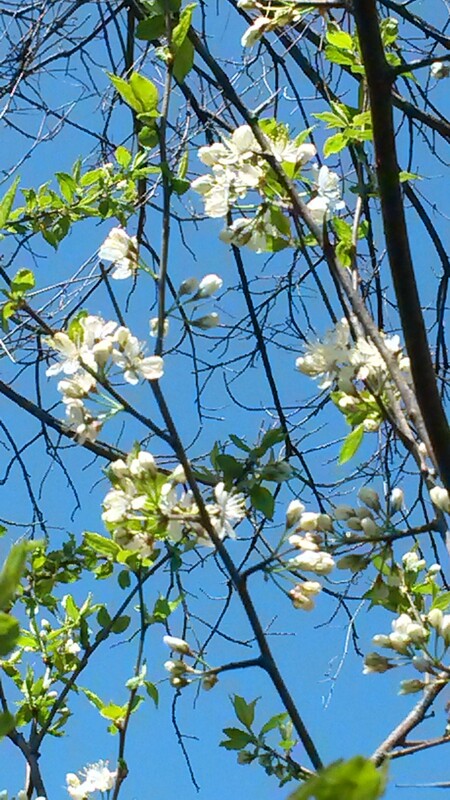 I hope your spring is going well. 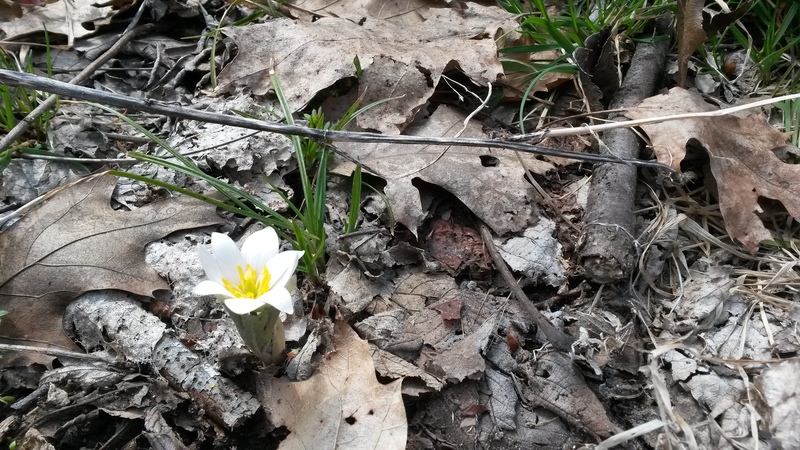 Winter has blended into early spring, warming and cooling unpredictably. 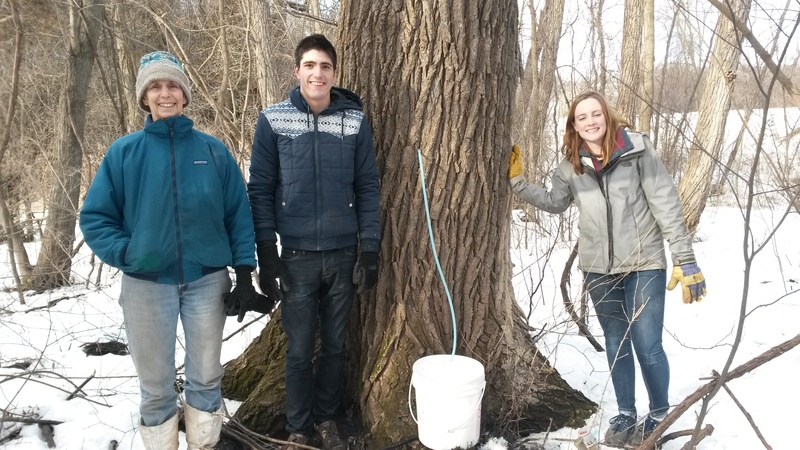 Tapping maple trees started a month early, but the repeated cool spells mean the sap is still flowing, still requiring attention. 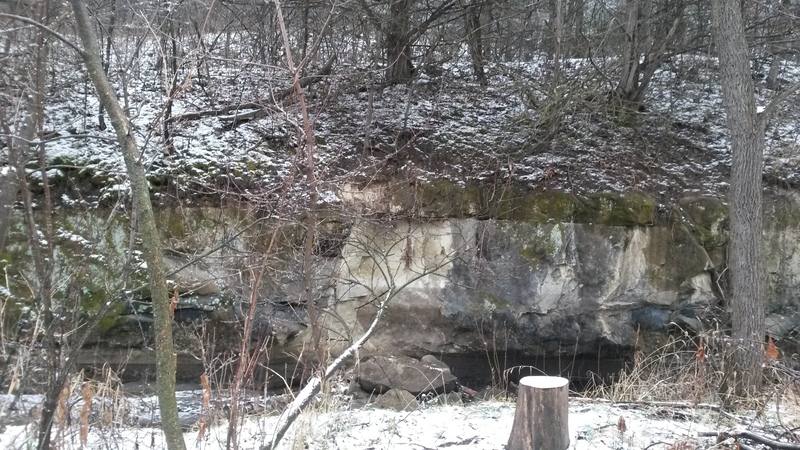 Activities are tapping maple trees and boiling sap, checking for new growth in woods, orchard, and garden, and harvesting the first nettles and dandelions. The point of Mountains and Waters Alliance is to learn to live with the earth, together with all beings including rocks, trees, rivers, meadows. This is real, not a metaphor. The 40 days this spring have the intention to make it real for us. We will be doing what we do not know how to do, and inviting teachers who may help us – while the real teachers are the hills and meadows themselves. Zazen is the backbone, and the home place, for this experimentation. In the first day, an opening retreat, some of the meditation time will be walking outdoors in receptive mode, just as we sit zazen in receptive mode, or listen to each other in receptive mode. There will be chanting practice, first with each other and then as an offering to sacred places outdoors. 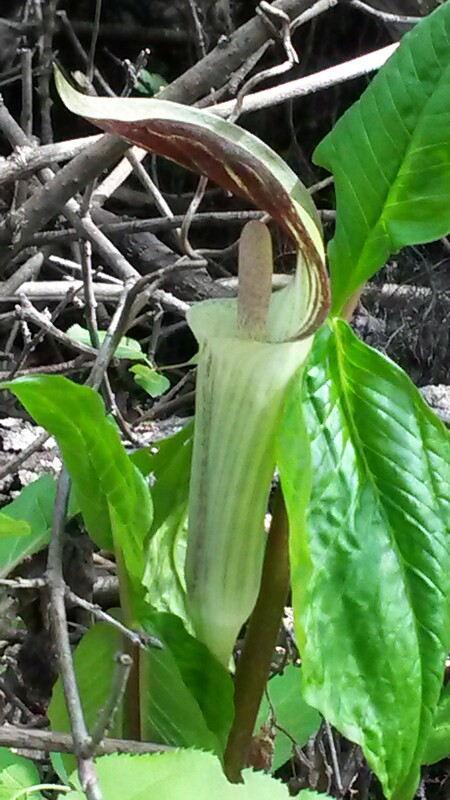 There will be a day of learning to work with plant devas to make flower essences, and many days of land restoration under the guidance of the nature spirits – which means learning to receive their messages. I hope some of you will come, for some or all of this time, to help ground Mountains and Waters in right relationship. It’s the most beautiful time here. First I called it “Earth-based Zen Practice,” then I changed the words and tried to make it a little more clear, here. Sugaring has been the big activity here. We have over a pint of black walnut syrup, nearly a gallon of box elder and half a gallon of maple – with an equal amount to be made from sap that’s waiting to be boiled. 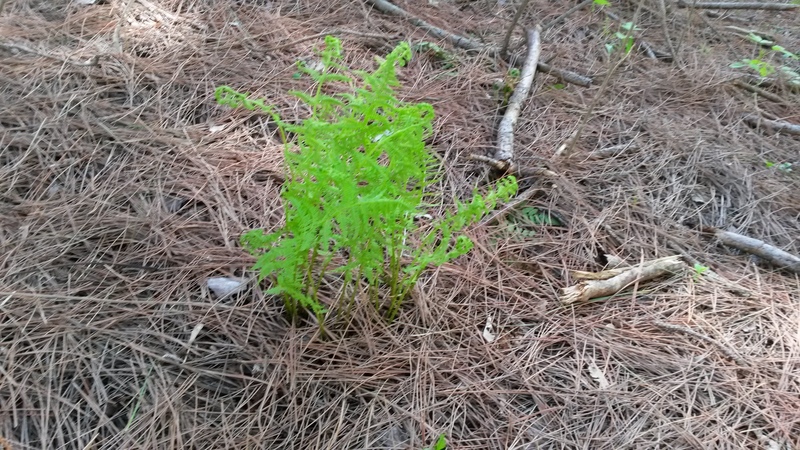 Stinging nettles are up – they’re tender when tiny, but require a lot of washing. I’ve had one meal with nettles, and made a pint of nettle pesto with too much garlic. They will be a primary food source shortly. I’ve been studying Sam Thayer’s foraging books, experimenting sometimes. I really liked dandelion roots and crowns. Instead of burning the fields to clear my way to the nettles, I decided it’s better to whack down the old plants and use them for straw; we need straw. My two-hour experiment with the scythe went better than expected. energy is there; even though I’ve had the flu for a week the land is now calling me to it, and there is gladness. Both writing projects are finally finished. There is still accounting, taxes, and organizing the office – but all those are part of this work, right here. The big outside distraction is an election campaign. Once again I’m allowing myself to hope that a certain candidate is what he appears to be. Zen reminds me: “Don’t believe what you think.” And don’t expect happiness from external things. But I’m a delegate to the county caucus, and am spending too much time following the whole thing. In the same way I follow climate change but try to ignore what I learn, and follow the murders (five this month) of indigenous environmental activists. I place their names on my altar, along with an old friend and a person in “The Jungle” in France who committed suicide. All this news comes through Facebook, as does news from environmental and other movements here in North America, from people I have met or feel like I know. The courage and determination of people who are giving everything, and the sorrow and cruelty in the news, breaks my heart in so many different way. Living comfortably in this beautiful place instead of being on the road, on the front lines of protests or hunger strikes, all I can do is include them somehow. Suddenly, everywhere I look, Zen people and spiritual people are addressing climate change, our relationship with the earth, and colonization, injustice, and the like. 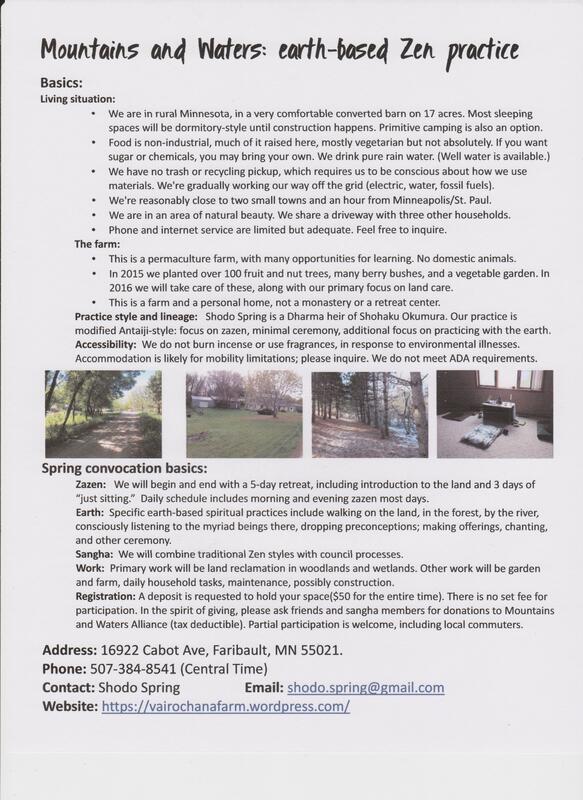 In particular, the very traditional Zen Mountain Monastery is devoting its spring practice period to “our one home, this great earth.” This letter describes it, and the talks are well worth hearing. Thank you all for your support. Please know you are welcome here. It’s been warm here. The plan for February’s work weekend was to clean up the sugaring equipment, and do some indoor carpentry work. But a look at the weather forecast changed all that. And a crowd of people came – first four, and then a group of three arrived just after they left. Cleaned up the pails, tubes, and equipment. Tapped the nearest tree, which is a box elder, for practice. Tapped some sugar maples, back in the woods. 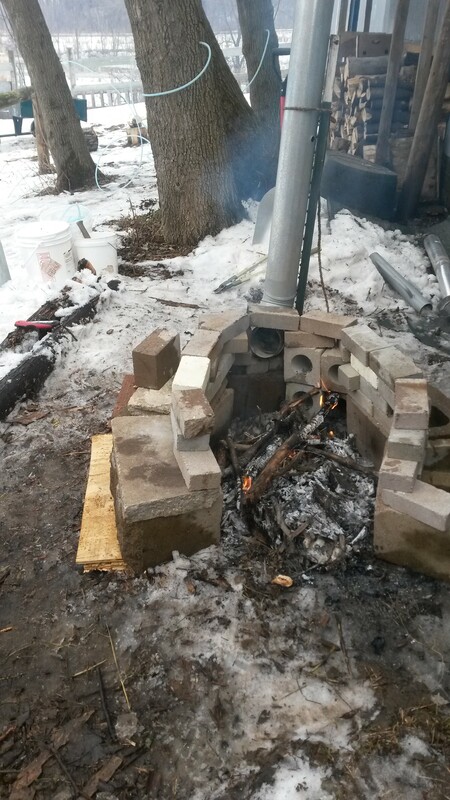 Cleared a space and built a fireplace for cooking the sap into syrup. Tapped some walnuts, by the creek. 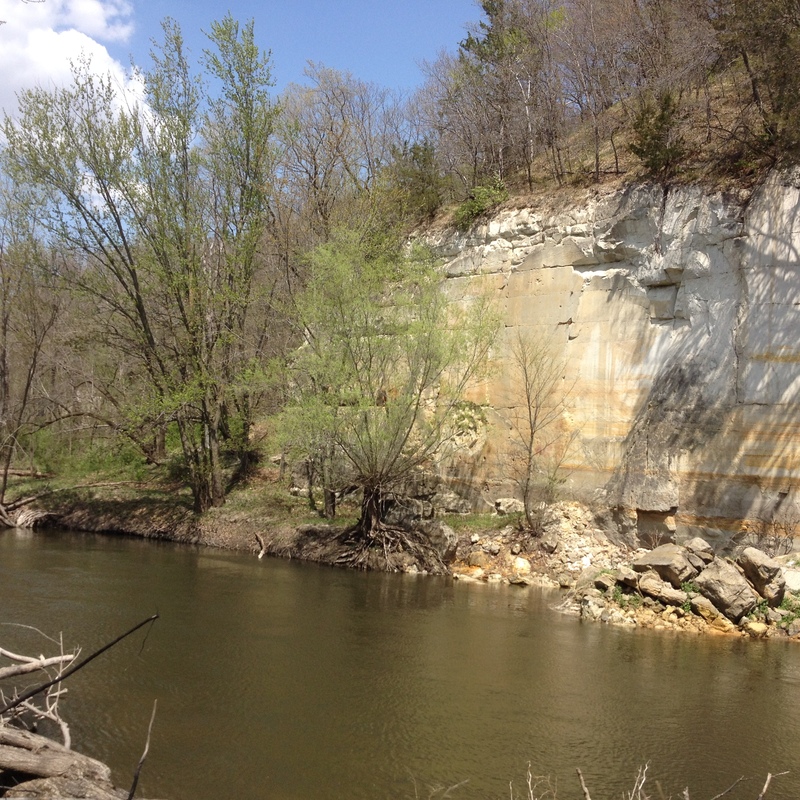 Went to look at the bluffs by the creek. Took a break, had snacks, and said good-bye. Washed a few more buckets and tubes. 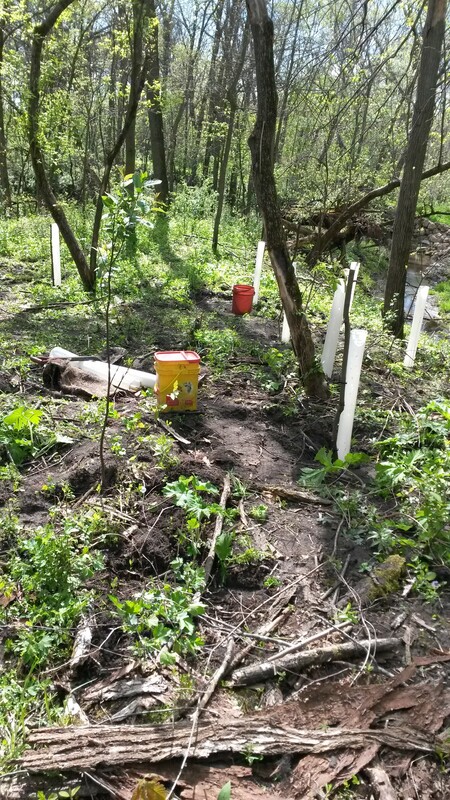 Went back to the creek, found the tools where we had left them, drilled two more holes in the last tree. Battery ran out. Went back home before dark. Said good-bye. Yesterday I checked the buckets. Three of the five maples, one walnut, and the box elder have some sap. I’ll check again on Saturday, when it’s supposed to be the perfect weather for the sap to run. (warm day, frozen night) When it starts really running, there will be a lot of work boiling. This is a month earlier than we ought to be tapping, amazing and wonderful but it’s climate change. Will the sap run the way it’s supposed to, or will something else interfere? What will happen next year? I’m planning to plant more sugar maples, but if we lose our cold winters they won’t grow, so should I still plant them? We’re in a frost pocket here, so maybe it’s okay and we should. This year I won’t be hiring casual labor the way I did last year. I hope to find a manager and an office manager, for work that is just too much for me alone. Mostly this year will be about consolidating, protecting the orchard, propagating the berries, and taking care of a small part of the woods: taking a slower pace and listening more to the land. The spring 40-day convocation (“calling together”) holds so much of my dreams. Learning to listen to the land, to really hear its voices instead of applying theories, even good ones like permaculture, to find what to do to care for, protect and nurture the land. An old friend who works with subtle energies of plants, crystals, and earth will be helping me. I hope some people will join me in learning. And I’m reaching out first to the Zen community, hoping that a shared language of spirituality will help us create the community of listening and caring. Not exclusively. 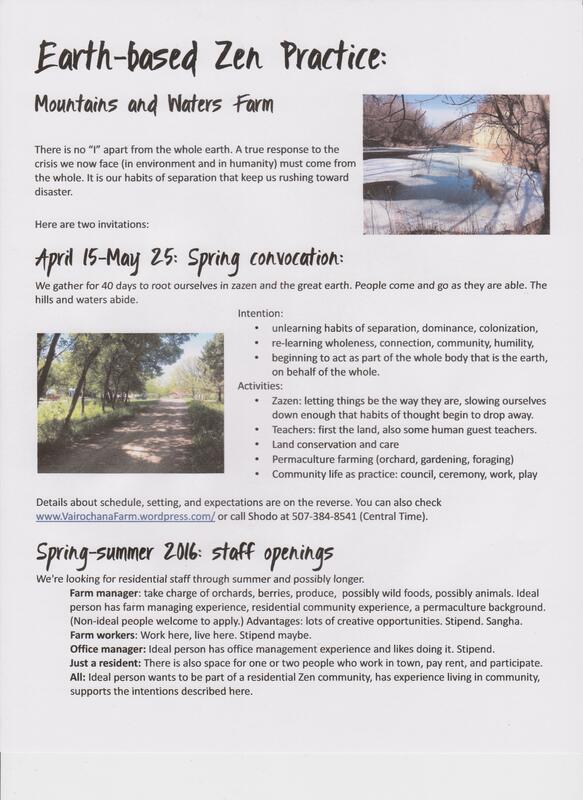 https://vairochanafarm.wordpress.com/2016-events/mountains-and-waters-spring-convergence/ If you feel called, consider whether you can come for part or all of this time. Though I am still the primary creator, a few people are getting more connected on the deep level. One person comes now and then to sit in the meditation space, and volunteers some time. Another is coming for a personal retreat, and will offer some work. Perhaps there will be more such. Those who find a spiritual home here are the ones who will be able to create with me, which is what I long for most. Meanwhile some friends and others are planning to come for a week, two weeks, a month, or to support the convergence by offering teachings. This needs to happen. As people come, we can do the minor carpentry that makes spaces for more to come, as well as the outdoor work that grows food and nourishes the land. Even though there’s increasing reason to think it’s too late for human survival, I refuse to say it absolutely. I am certain that industrial civilization cannot be saved, nor do I want to save it. Somewhere in the space between those extremes is my life and work. I plant trees and hope they will have a chance to grow before the climate changes too much; I plan greenhouses to protect plants from extremes; I learn to forage, to save seeds and put up food. But most of all, I seek to release my life. Daniel Quinn speaks of peoples “living in the hands of the gods.” I wish to live in that way, and notice constantly how much I do not. My need to control and to figure things out is called colonization; my ancestors have been colonized for over a thousand years so I am not to blame for it, but as a result I participate in colonization, genocide, and land destruction. There I am responsible. I seek decolonization internally, and listen closely to the voices for literal decolonization of the continent. What kind of heart will we carry forward with us? That is what matters, whether we survive or not. There will be difficulties here, as there already are elsewhere. There are official climate refugees in the United States, not only elsewhere, and there are hungry people as well. I am happy to see my Zen sisters and brothers meeting the issue, facing it directly. May we all find our way, in this time, with compassion. You are invited to come here this spring for earth-based Zen practice – see the poster below and then ask questions. You don’t have to already be a Zen person. People are starting to come, and there’s room for more. 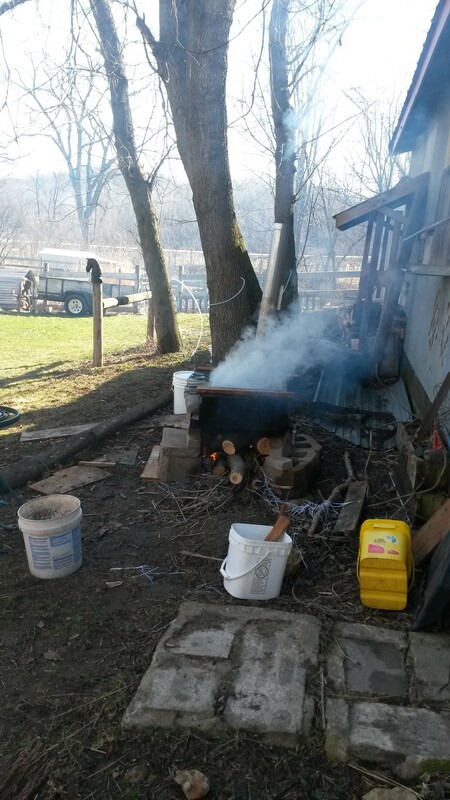 Last year we did maple sugaring in mid-March; this year we start late February. I read the news on climate change, and watch the responses to refugees – and ache. I can only throw my lot in with the earth – Gaia herself, plants and animals, waters, minerals and winds, and humans. There will be no fence around this land to keep out refugees, if it happens that we have food and warmth longer than others. And if we don’t manage to make the house passive solar, or build the water collection system and the greenhouse, still we have hand saws and water barrels and it will work. We’re just here.